The science is in— tar sands oil is much dirtier than conventional crude. It has an outsized climate impact, is terrible for air quality, and when it spills it’s much harder to clean up than conventional crude oil. And now Phillips 66 wants to expand its refinery to process more tar sands in the San Francisco Bay Area. This would significantly increase the amount of oil tankers coming into the Phillips 66 refinery in the bay! In addition to its negative impacts on California,increasing tar sands production is bad for indigenous communities at the source in Alberta, and transporting it via oil tankers threatens devastating oil spills in the waters of British Columbia, Washington, and Oregon as well. It’s important that the Bay Area Air Quality Management District (BAAQMD), Contra Costa County Board of Supervisors, Gov. Newsom, and other key decision makers do everything they can to stop Phillips 66 from completing this expansion project. Thanks to public pressure from people like you, in 2017 we defeated Phillip 66’s plan to build an oil train terminal in San Luis Obispo that would have also imported tar sands. Phillips 66’s marine terminal and refinery expansion is their last ditch effort to bring more dangerous and dirty tar sands to their Bay Area refinery and we need your help. Will you join us in urging Gov. Newsom and other key decision makers to reject this harmful proposal? Tar sands oil harms our air, water, climate, and indigenous communities. We respectfully urge you to reject Phillips 66’s refinery expansion that would double the number of tankers delivering to their refinery and allow them to process tar sands. To add your voice, click here. 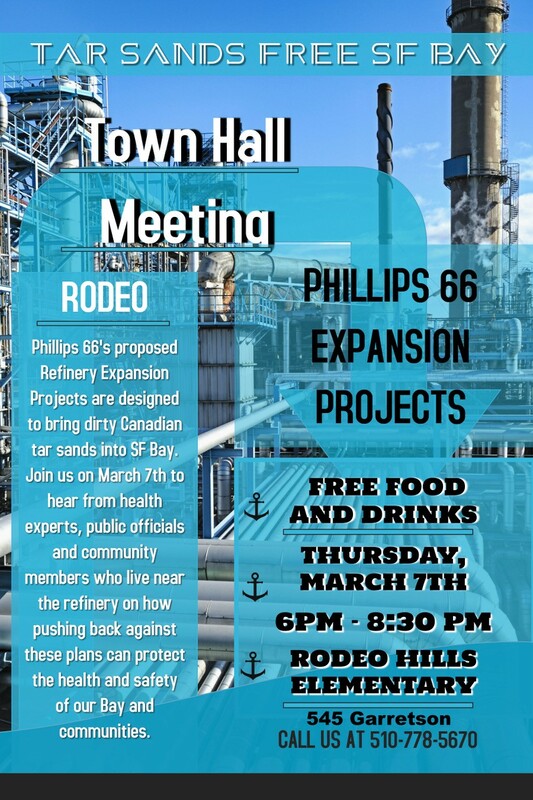 This coming Thursday, refinery corridor residents and allies are presenting a community forum on Phillips 66’s very dangerous plans to expand tar sands refining at its Rodeo facility. 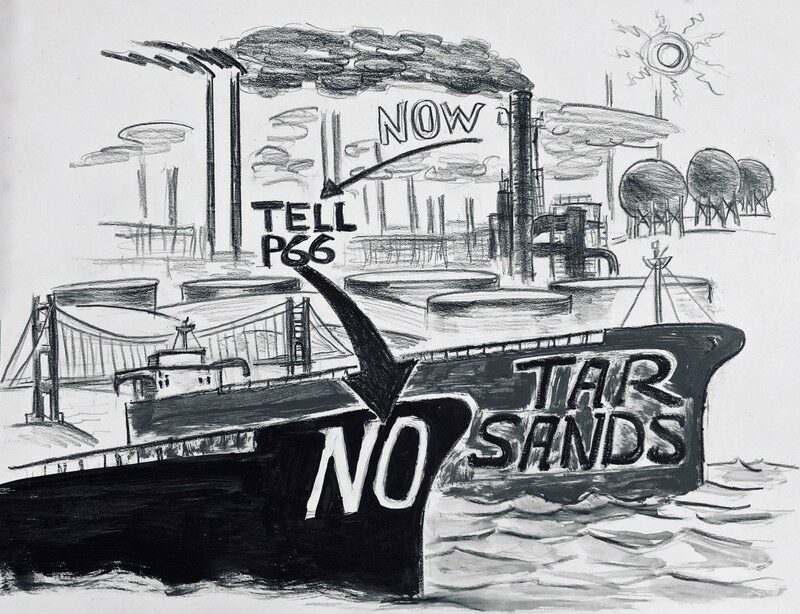 Increased use of tar sands in the P66 crude slate means vastly increased tanker traffic in the Bay, an increased risk of spills, and increased assaults on community health and our worsening climate. This town hall is an opportunity to learn about the two linked P66 proposals—the first Environmental Impact Report drops soon—and what we can do to stop them. Please come out to listen, learn, and offer support to impacted community residents. Rodeo Citizens Association, Crockett-Rodeo United to Defend the Environment, Fresh Air Vallejo, Sunflower Alliance, 350 Bay Area, Idle No More SF Bay, Communities for a Better Environment, and Stand.earth. Visit facebook.com/standearth at 6:00 PM PST on Thursday, March 7th.